International organizations and more than 35 countries made recommendations on revising both the structure and content of the draft European Action Plan for Strengthening Public Health Capacities and Services. 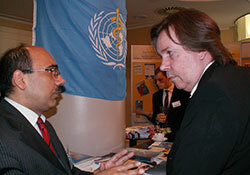 The recommendations were made during a consultation held on 12–13 March 2012 in Brussels, Belgium, organized by WHO/Europe and EuroHealthNet. The European Commission – represented by the directorates-general for Health and Consumers; Employment, Social Affairs and Inclusion; Regional Policy; Development and Cooperation; and Research and Innovation – described how the Commission’s policy instruments and tools could help strengthen capacities for public health across Europe. Hans Kluge, Director of the Division of Health Systems and Public Health at WHO/Europe, said: “While there is clearly a high level of enthusiasm surrounding the Action Plan, it is also clear that we need to continue working on the draft to ensure that it sets a clear direction for the years to come, and provides added value to all of our countries. The final draft of the European Action Plan for Strengthening Public Health Capacities and Services will be submitted to the sixty-second session of the WHO Regional Committee for Europe in September 2012.